It’s that time again, where a year has ended, and another is beginning. Here’s a look back at some of my favorite comic book and horror moments from 2013, and what’s coming in 2014. I’ll also mention what I accomplished in the past year, as well as what is in store for next. What are your resolutions? What are your favorite moments? Comment below. What are you looking forward to? This has been a week of news that may even surpass that of comiccons. Fox, Sony, Marvel, and Warner Brothers continue to compete with each other to see who can get the most news to us, and most memorable. Here is a quick summary of what we know about the upcoming films/shows, and my own speculation/suggestions as to how it should happen or may happen. X-Men Days Of Future Past: The Wolverine leads directly into this (you’ll know what I mean if you saw the end credits scene). The cast of the original cast (well most of them) and the First class cast (most of them as well) will be taking on the classic story from my child hood. We know that Bolivar Trask and the Sentinels are the main villains. We also know that newcomers Bishop, Sunspot, Warpath, Quicksilver, Ink and Blink will be in it. Wolverine will be sent back in time to “possess” his younger self, and try to prevent the events that lead to mutant prejudice. This event is probably the assassination of JFK, which Magneto is assumed to have been responsible for, and mystique having some sort of role in it. —— This will be a reboot, sure, but what will it mean for the past cast? Will they kill off Logan? He’s not getting any younger. X-Men Apocalypse: All we know now is that Apocalypse will be the villain. —— They should bring back Angel for this story. It’s only logical. I believe that the events in DOFP will change the future in a way where Age of Apocalypse will begin. A darker present will emerge, with the first class characters and possibly a recasting of some of the veterans. Cyclops should be brought back. We never saw a dead body in X-3. He could have been taken by Mr. Sinister and made into one of the horsemen along with Archangel, and two others. X-Force: All we know at this point is that the writers like the current run in the comics, and are working on it. —– Who should be involved? I personally want to see Domino, Psylocke, Cable, Deadpool, and Archangel. Maybe even fantomex or a cameo by logan, but I really think this should be fresh and not use Wolverine. Wolverine 3: Hugh Jackman is back with the same director who did an outstanding job on The Wolverine. He’s now got bone claws, which may be corrected by magneto being an ally in DOFP. Either way, it’ll be fun. I want to see Alpha Flight and Logan going up against Omega Red and Department H. I can’t think of a more fitting storyline for them to tackle, and they can end his run here respectfully. Unless they want to do an old man logan storyline, which would be awesome. Fantastic 4: It will be a reboot, and exist within the same universe as the other Fox owned Marvel properties. The Amazing Spider-man 2: Electro is the main villain. Gwenn Stacey dies. Rhino and Hobgoblin (Ultimate versions) are in it. Doctor Octopus, Vulture, Venom and Morbius were all hinted at in the trailer. —- This needs to be done VERY carefully. As much as I want to see Sinister Six on screen, and Venom done right, I can’t see how they can cram it all. If (Mecha)Rhino and Hobgoblin are in it as small roles, then it’ll work. Having it set up for the third film, which is planned already with Rhino at least returning, and introduce Black Cat would make the most sense. Then they can taper off into 4, which is also confirmed as in the works and bring in Mysterio as a singular menacing villain. There are various spinoffs in the works too… I can only assume (and hope) that one of these is Venom, and will feature Carnage as the villain. Make it dark and gritty. Thor 3: It is all but confirmed. The Dark World has grossed over 600 million worldwide, so it’s inevitable. —– thoughts? I believe Loki died in 2, and made a deal with Hela for Odin’s soul, so that he could come back and assume the throne. Loki teaming with Enchantress and Executioner and a reference to Surtur and Hela would be a great way to keep it going. Guardians of The Galaxy: What we know is that it might take place slightly in the future, that the Collector is the villain, that Adam Warlock’s cocoon was in Thor 2. We also know that The Mind, Space and Soul gems have all been used in the movies, and that there is a good possibility we will see the Time gem, and maybe another gem make their debut, setting it up for Avengers 3 with Thanos. Avengers Age Of Ultron: Quicksilver and Scarlet witch are new additions with Ultron as the villain, and the original cast returning. —- This will probably be an epic movie, though I’m a little leary about not being about to call Pietro and Wanda mutants. I have faith though, and am interested in seeing Ultron on screen and how they will transition from phase 2 to 3. Captain America The Winter Soldier: Bucky survived the fall, and we all knew it was going to happen. Crossbones and Falcon also will make their debut on the big screen. I’m excited to say the least —– I believe that Robert Redford’s character is actually the Red Skull in disguise (or perhaps Baron Zem0), and other than the SHIELD characters involved, I dont think it will really tie into the other movies, and will seem more stand alone. Agents of S.H.I.E.L.D. ——- all I can say is this…. I enjoy it, but have many issues with it. In order to survive as a series, they really need to start adding people from the comics. This half assed SHIELD team just isn’t going to cut it for long. The ONLY reason I’m hanging on at this point is because I want to know what Coulson’s deal is… is he an LMD? Did Magic ressurect him? They are hinting at both robot and magic, so I’m interested. I want to see it survive, but even I am having a hard time staying. Marvel Miniseries’: Luke Cage, Iron Fist, Jessica Jones, and Daredevil are all getting their own thirteen episode series’ where they will then tie in to forming a Defenders type group. —- I’m all for this, but wish they’d do heroes for hire instead of Cage and Rand separately. Jessica Jones holding her own will be tricky; however I do think that by using the Kingpin as the main antagonist for ALL of these, it would be fun and exciting. Phase 3: Dr. Strange and Antman are the only two confirmed to lead into Avengers 3. Rumors of Black Panther and Inhumans still circulate. — Make it happen and add a new Hulk movie in there. We never got to see the Leader, despite the setup. Batman vs Superman: Batman’s costume will be more like the traditional black and grey and less armored. Lex Luthor is one of possibly 2 villains (the other being Metallo). Wonder Woman has been cast. There will be cameos by other JLA members. ——- I’m dying to see Affleck in his role, and I think Gal Gadot is beautiful, but she really needs to gain a few pounds. I don’t want Wonder Woman as a main character. Instead, I’d love to see Diana Prince as a potential love interest for Bruce Wayne. Her role could be as simple as observing the other two Trinity heroes and deciding whether to trust man or not. In the end, revealing her true identity would be a great way to kick off JLA. The cameos by other heroes is nice, but I’m hoping it is a quick reference to other people with abilities, and that is all. maybe a flash (pun intended) shown on a monitor or something quick in a news feed. Justice League: —– not much is known. Please, for the love of God, have Stephen Amell’s Green Arrow and Gary Gustin’s Flash in it. learn A lesson, DC. Superman Returns would have been better with Tom Welling in a Smallville spinoff. Not that Smallville was perfect (it was far from it) but it was established. No one wanted to see someone else in the role. Arrow is doing EVERYTHING right. Tie it all together; otherwise you will have some seriously confused audiences, and countless irritated fans. Arrow: What’s to come? Clock King, Ra’s Al Ghul, Solomon Grundy, Flash, possibly the real Black Canary, references to AMAZO, Red Arrow donning the hood, Oliver finally using an eye mask, Deathstroke, Suicide Squad…. the list continues to grow. It’s established. It’s having a Flash spinoff…. Make it part of the movie universe. I can’t stress this enough. Oh, and one other thing. Get rid of Laurel (Dinah) Lance’s sister. Laurel needs to be likeable again, get her crap together, and become the real Black Canary. There you have it. My two-cents, and hopefully someone will listen out there. Bring me in as a writer or consultant. What do you think? Which movies are you looking forward to? What are your thoughts? Do you agree or disagree with my comments? Chime in. The bottom line? I’m a comic book fan. I want to see both DC and Marvel succeed. I want the best of both worlds. For our first comic book battle poll of 2013, I figured we’d be a little more down to earth (see what I did there?). Like all of our battles, we encourage you to vote at the bottom. The results of the vote will determine our victor. If you feel there is some other character that would fit in this fight, then by all means, click “other” and mention who your vote is for. Now to get to it. For Marvel Comics, Sandman steps forward. DC has Clayface in their corner. sCrypt Comics brings Barbas to the fight. And Midway makes Tremor step forth. This battle will determine which comic book company has the superior king of the earth. William Baker, aka Flint Marko, was exposed to irradiated sand in a nuclear testing facility as he escaped from prison. The result gave him a body that fused with sand. This gave him the ability to change shape, control the sand around him, Manipulate his mass and density and enhanced his strength and endurance. 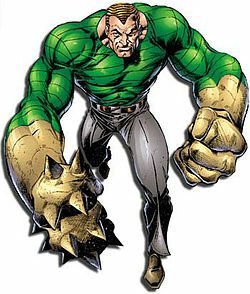 Sandman first appeared in The Amazing Spiderman #4 in 1963. Next up is Clayface. Though there have been various clayfaces throughout the comics, for this battle we are going to use the Matt Hagen version. 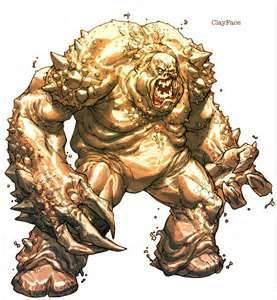 Hagen was a treasure hunter who stumbled upon a pool of protoplasm, which gave him temporary abilities. Later replicating the process to be more permanent. This has given him a body composed of living mud with the ability to change shape, manipulate and divide his body, and shift his voice. The original (Karlo) Clayface first appeared in Detective Comics #40 in 1940, while Hagen’s version came later in Detective Comics #298 in 1961. Barbas is a being from a time before mankind, when angels and demons ruled the planet. As the demon of Pestilence, Barbas has the ability to raise the dead from the earth, and replace lost body parts with those of others. The demon can command the earth to shape at will, and uses its minerals to help mend any lost or damage body. 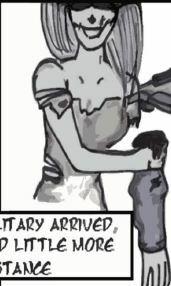 Barbas first appeared in “Flesh And Leftovers” (The novel) in 2010, while in graphic novel form first appeared in “Flesh And Leftovers: Zombie Incidents” in 2010. Tremor may not be well known outside of the Mortal Kombat universe of comics and games, but he is a heavy contender as well. As a member of the Black Dragon Clan, this ninja has a muscle mass that many believe is because of his hardened abilities. He can create earthquakes, channel rocks through him as a projectile, and even summon magma to emit fireballs. 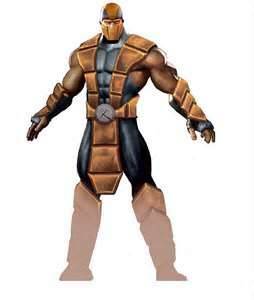 Tremor first appeared in Mortal Kombat: Special Forces in 2000. Well, there you have it. The masters of earth control have spoken. Which is your favorite in this battle? Which do you belive would win? Cast your vote below, and stay tuned for the results in a couple of weeks.